Thank you for your response. Unfortunately, this does not work either. However, I think I came a bit closer to the problem. The indication of the bearing itself is obviously correct (absolute value. see also attached pic). Means to absolute coordinates with 0 degrees at 12 o'clock. The 'wrong' thing is that it is not in relation to the current indication of the HSI rose. 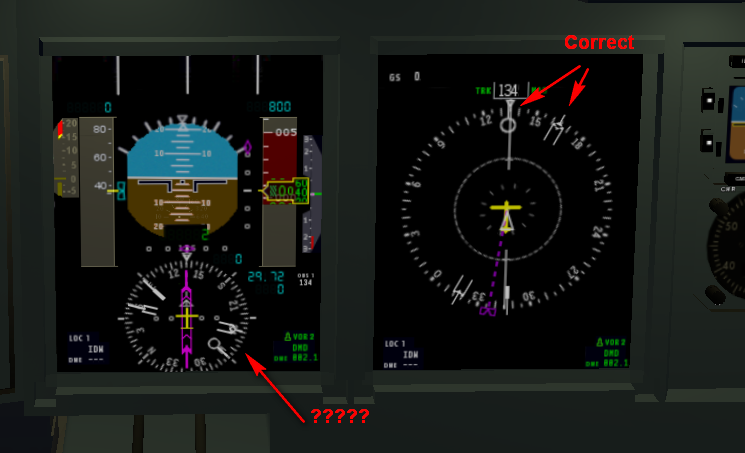 There is no difference in the behaviour if I use sim/cockpit2/radios/indicators/nav1_relative_bearing_deg or sim/cockpit2/radios/indicators/nav1_bearing_deg. Perhaps you could look again into this matter and give some idea. The indication of the bearing itself is obviously correct (absolute value. see also attached pic). Means to absolute coordinates with 0 degrees at 12 o'clock. The 'wrong' thing is that it is not in relation to the current indication of the HSI rose. I suggested the use of the DataRef with "relative" because it is "in relation to the current heading" or HSI compass rose. You second screenshot shows the pointer at 90 degrees, which I believes is the default position when there is no signal to the radio. Make sure you have a NavAid tuned in that is in range. Thank you very much for your reply. In fact this also my understanding of 'relative bearing'. 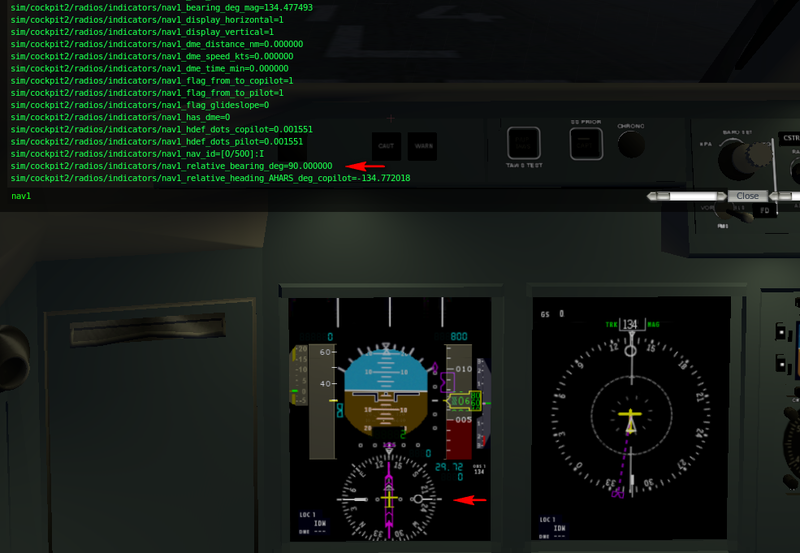 The second screenshot shows a situation where the NAV1 IS tuned to the ILS (please refer to the HSI on PFD) and on the MFD rose the NAV1 pointer shows the correct direction (same direction as ILS indicator, screenshot was made when plane is positioned on that runway). This is exactly the point where I got stuck, i.e. that on the MFD the NAV1 pointer indication is absolutely correct. Do you have any idea in which direction I should investigate this matter further? Is the MFD built with generic instruments?, or is that a default instrument? In any event, I would really need to have the aircraft to diagnose the situation. However, I still believe that the "sim/cockpit2/radios/indicators/nav1_relative_bearing_deg" is the correct one. Thanks for the quick response. Yes, the MFD is the default instrument. That's why I am so puzzled. I will countercheck again all setup of the generic instrument (NAV1 indicator) etc. and let you know. A short feedback on some progress: Except NAV1 (ILS) everything now works fine. I could not find a basic mistake, however, what I did is to build the indicators again from scratch in the 2D-panel of PlaneMaker. After having tested the 2D-panel I copied them to the 3D-panel where everything seems to work fine. To my surprise this approach (building from scratch) did not work if I did it directly in the 3D-panel of PlaneMaker. The situation with the NAV1 remains strange. If I tune NAV1 to a VOR it works fine but as soon if I tune it to an ILS frequency it does not work (although there is a correct indication in the default EFIS means there is a signal). Is there perhaps some setting missing in my setup of XPlane10? By the way, i have tested it with a 'standard' plane of XPlane10 (B747 NASA) with the same result. If I tune NAV1 to a VOR it works fine but as soon if I tune it to an ILS frequency it does not work (although there is a correct indication in the default EFIS means there is a signal). Ahhh... so that clears things up a bit. (ILS is not omnidirectional). That's it! Many, many thanks for your help and patience!